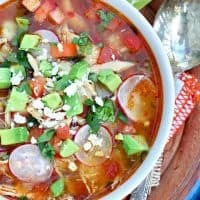 SLOW COOKER CHICKEN POSOLE — Chicken and hominy are slow cooked in a seasoned, tomato based broth, then topped with fresh herbs and vegetables in this classic Mexican soup recipe. The weather is getting cooler, which means soup is starting to appear on my menu again. 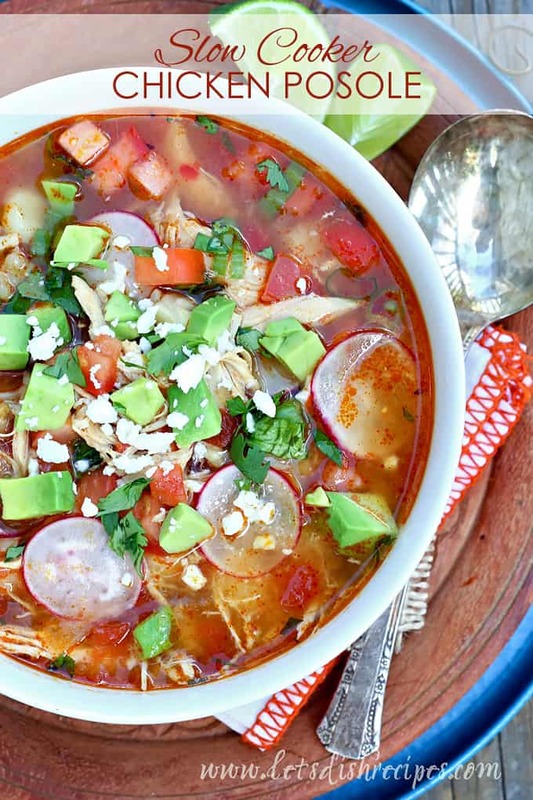 And this Slow Cooker Chicken Posole is a new favorite. I just love the warm chicken and broth with the contrast of the cool, fresh vegetables. It’s the perfect soup for early fall, when there are chilly evenings, but so many fresh summer vegetables are still in season. And in case you’re wondering, posole means hominy in Spanish. And hominy is the star ingredient in this soup. What is hominy, you ask? Well, basically you take corn kernels and soak them in an alkali solution of either lye or lime (the mineral, not the fruit). The process is called nixtamalization, and it removes the hull and germ of the corn and causes the grain to puff up to twice its normal size. As crazy as it sounds, it’s really delicious! Besides being delicious, I also love that this recipe is great for picky eaters. I just serve all of the toppings and mix-ins on the side and let everyone add what they like. Sliced radishes and avocado are my personal favorites, but I usually add all of the toppings. 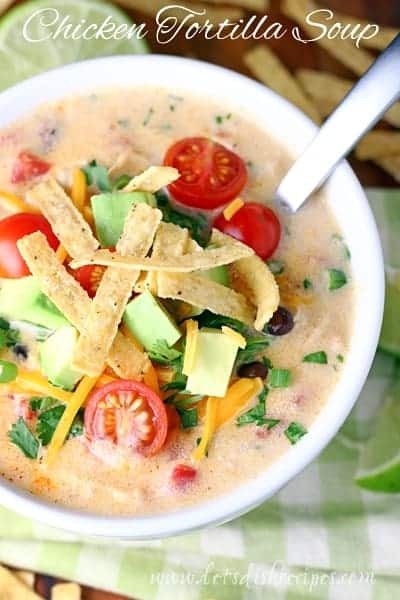 This soup is really suitable for any season of the year, and it’s a dish we’ll definitely enjoy all year long! 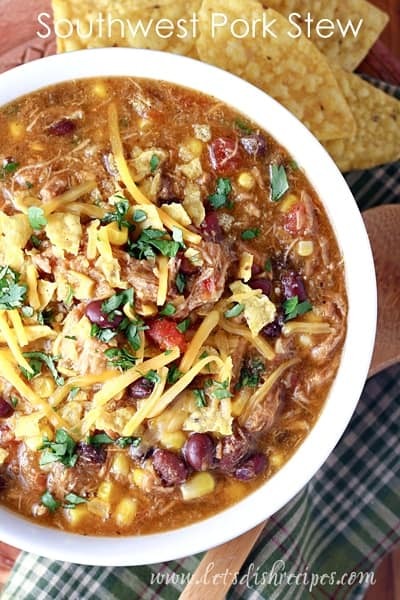 Be sure to save this Slow Cooker Chicken Posole recipe to your favorite Pinterest board for later. 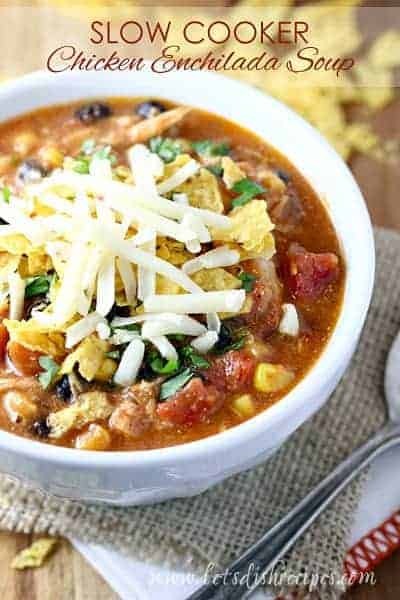 Chicken and hominy are slow cooked in a seasoned, tomato based broth, then topped with fresh herbs and vegetables in this classic Mexican soup recipe. In the bowl of a slow cooker, combine the broth, hominy, diced tomatoes, enchilada sauce, onion, garlic and seasonings. Add the uncooked chicken breasts. Cover and cook on low for 6-8 hours. Remove the chicken from the slow cooker and shred. Return the chicken to the slow cooker, along with the 1/4 cup chopped cilantro. Season soup with salt and pepper, to taste. Who Dished It Up First: This is a combination of two recipes, from Love Bakes Good Cakes, and the Kitchn.